Warning: This isn’t one of those happy news updates that opens up new doors for your marketing — like Facebook announcing embedded posts. Nope — this is one that’s going to actually close some doors for you. And like Peter Griffin says, it’s really going to grind your gears. Yesterday, Search Engine Land reported that Google has made a change aimed at encrypting all search activity — except for clicks on ads. So Google says, the reason for the switch is to provide “extra protection” for searchers. Search Engine Land, however, suspects that Google may also be attempting to block NSA spying activity — since Google was accused of giving the National Security Agency access to its search data back in June (which it has strongly denied). We also can’t help but think that, because Google is encrypting search activity for everything but ad clicks, this is a move to get more people using Google AdWords. And other webmasters have been reporting a similar lack of insight. Not Provided Count, which tracks 60 sites to chart the rise of the keyword “(not provided),” has been reporting on the effects of encrypted keywords over time. In the chart below, you’ll notice a spike starting around the week of September 4. 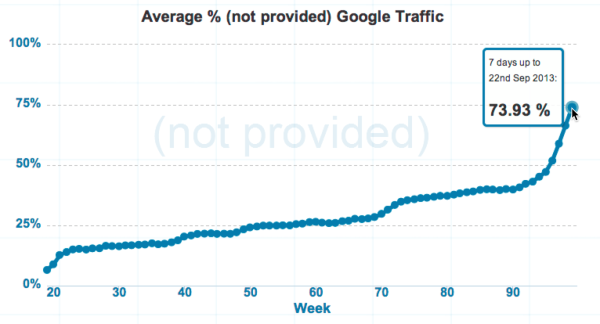 Today, the chart indicates that nearly 74% of search terms are being encrypted. Just like we predicted earlier this year, with Google encrypting all keyword data, this means marketers will not just lose some of their Google keyword insights — they’ll lose all of them. While there are still a lot of unanswered questions that Google has yet to address (for instance, when will we lose all this data? ), there’s still a lot of cause for concern for marketers. How will we know how searchers are finding our websites? How will this affect our content strategies? It is still possible to tell how much traffic your website is getting from organic search. Although you might not know the exact keywords, you can still correlate the work you do to optimize your site and create content to increases or decreases in organic search. Other search engines like Bing and Yahoo continue to pass along keyword data. According to comScore, at present, Google.com has about 67% of search market share, Bing has 18%, and Yahoo has 11%. Although this will not provide the full picture, analytics tools like HubSpot can continue to show keywords for the 33% of searches that come from search engines like Bing, Yahoo, AOL, Ask.com, etc. 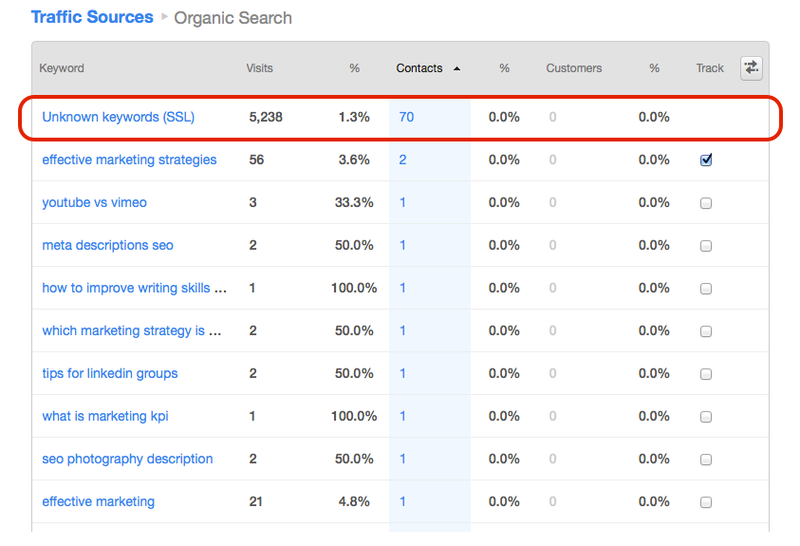 This data will give marketers at least some indication of which keywords are the most useful. If you use Google AdWords for pay-per-click marketing, connect your company’s AdWords account to your Google Analytics account and use that data for keyword research, as Larry Kim of Wordstream suggests. Rank will continue to play a role in helping measure the results of search engine optimization and content creation.